This is GIEI’s Year of the Tomato, popularity winner of the nightshade family. More about tomatoes soon! but today I’m going to talk about a few other members of Solanaceae that I’m growing. 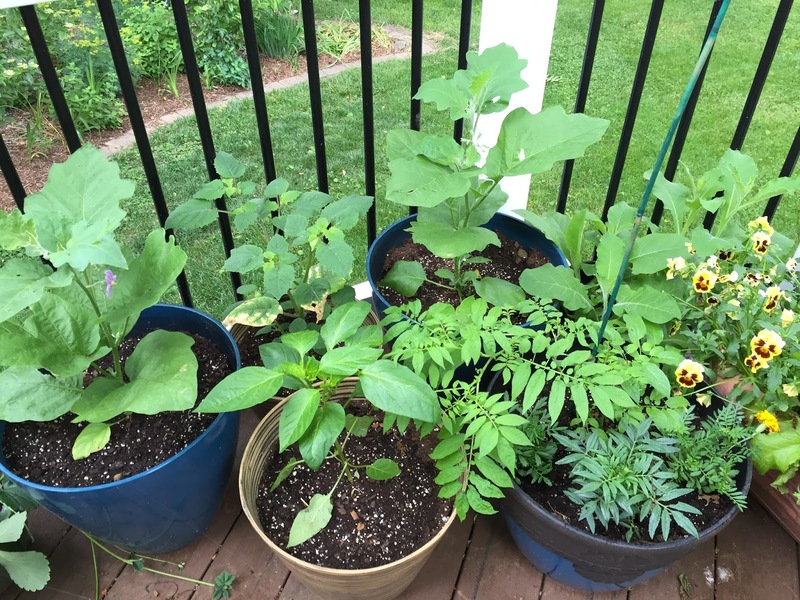 Here’s the nightshade corner of my deck, where I keep some of my vegetables going in not-quite-enough sun. This picture is actually a week and a half old; the plants have grown since then. To the left, and then in the middle of the back row, I have two Long Purple eggplants. Growing eggplants in containers up on the deck allows me to keep them uncovered, since flea beetles seldom find them up there. (If planted in garden soil, or even in raised beds or containers sitting on the ground, they are best served by providing row cover until they get big and sturdy. Flea beetles hang out down low.) Eggplants self-pollinate with a bit of wind, but I’ll keep an eye on their fruit production, and also will limit the nitrogen fertilizer as they grow – last time I tried this I ended up with huge healthy plants with no flowers or fruit, since too much nitrogen means lots of leaves but less of the part you want to eat. Between the eggplants is a poha berry, which is apparently a GIANT GROUND CHERRY – well, at least bigger than the usual kind. I will report back. In front of that is an Antioch pepper, a family heirloom of one of our Master Gardeners. I try to grow this one every year isolated from other peppers so the seed won’t cross and can be saved. One plant will only provide enough seed to share with local growers, but I have some from last year if you want to try it. The peppers are long and mildly hot, and can be eaten in pale green or red stages. To the right of the pepper is a crazily-branching thing called a Tzimbalo, which is supposed to be a quicker-producing relative of the pepino melon, making small sweetish fruit. I have no idea if I’ll get anything from it, but it’s worth a try. Another plant has already died in the ground at the demo garden, and the one in my community garden plot is struggling at about a quarter the size of this one. Apparently container growing is the way to go. Maybe. Tucked away in the back you can see the rising stems and big floppy leaves of nicotiana, which is also in the nightshade family (though not to be eaten). Pansies and marigolds are not relatives, just there to be pretty. 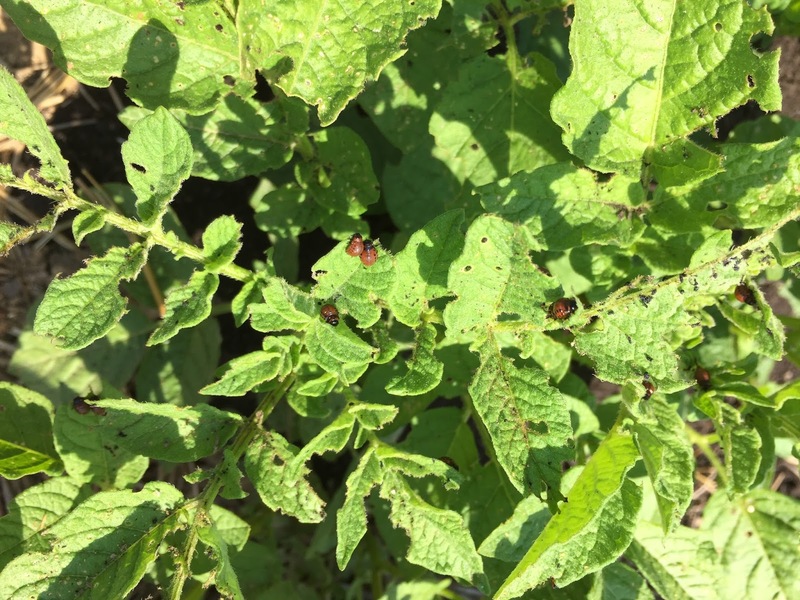 At the community garden, along with several other nightshades I have planted some King Harry potatoes, which are supposed to be resistant to Colorado potato beetles due to their hairy leaves. Well, guess what. I will note that this is the plant doing the least well (which might be due to soil or some other factor) and the others are not nearly as infested, and that potato plants in other plots have a lot more adults on them (and probably larvae too). We have some King Harrys at the demo garden too, and I will check on their status tomorrow. Anyone else growing unusual or interesting nightshades? HI Erica — I'm interested in how your Solanaceas do with the Nicotiana in between as I had always read to keep that plant away from tomatoes especially to prevent tobacco mosaic virus, but maybe the pepper and eggplants aren't susceptible. I'll watch for your updates! I was given some seed for Sweet Aperitif cherry tomato from John Magnasco of Garden America when I stopped at his booth at MANTS this spring. Had a taste of the first one, wh I think I picked a hair early, but it was delicious. So far everything looks good, aside from a small amount of hail damage to the eggplant leaves. Mm, sounds like a great name for a tomato.